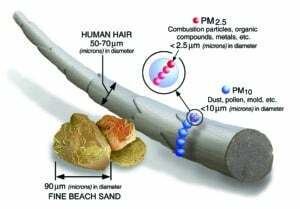 What is Particulate Matter (PM) Pollution? Particulate matter (PM) pollution is defined as any solid or liquid material in the atmosphere. PM pollution includes PM10 and PM2.5. PM10 are all inhalable particles that are 10 micrometers in diameter and smaller. PM2.5 are the finer inhalable particles that are generally 2.5 micrometers in diameter and smaller. While we are focusing on PM pollution from manufacturing sources in this blog there are many other sources of PM Pollution. Construction, power plants and even forest fires omit PM Pollution into the atmosphere. In Manufacturing these submicron particulates can be visible to the naked eye if larger than 7 micrometers. The smoke plumes seen in the air are made up of these particles. Some of the smaller particles are not visible to the naked eye and must be measured by a particle counter. The diagram below shows a size comparison for PM Particles. How does Particulate Matter (PM) Pollution effect you? Employers must put safeguards in place to protect their employees from PM Pollution. These particles are considered the most dangerous of lung damaging pollutants. They can penetrate the deepest part of your workforce’s lungs without their knowledge and can eventually enter their bloodstream. These airborne particles can disrupt the manufacturing process by preventing machinery from running smoothly which then increases downtime. Finished parts can also be contaminated from PM pollution if it’s not properly contained. While PM Pollution can be alarming for both the employee and employer there are ways to contain these harmful particles. The most efficient way to extract these particles in most manufacturing facilities are electrostatic precipitators. This powerful high-efficiency air cleaning technology can achieve a particle collection of up to 99.3% at .01 micron. Electrostatic air cleaners capture these smallest particles which go deepest into your lungs. An interesting fact to consider is a particle that is 2.5 micrometers in diameter can take up to 3 days to settle on a surface from being airborne. Therefore, you can have existing equipment for filtering these particles out of the air but still have visible smoke plumes. We have 40 years of experience working with manufacturers to safeguard their employees’ health and maximize their businesses output and are well suited to help you diagnose your existing electrostatic equipment and recommend the needed changes. We are always willing to help. You can Contact Us here or give us a call (847)451-0844 to set up a consultation.